Current condition of the Midland Depot at Divide. The non-historic east (left) addition, added in 1987, serves as administrative office space for T.H.E. Coalition. Paint sampling revealed the rich brown color of the original Depot. The historic north (right) Depot is a designated Teller County Historic Landmark. A recent archeological assessment funded by a grant from Colorado State Historical Fund, revealed several previously unknown historical features, including a powder magazine used to store explosives needed to clear snow from the railroad tracks. The Colorado Midland Railway built the first standard gauge line into the Colorado Rockies in 1886. 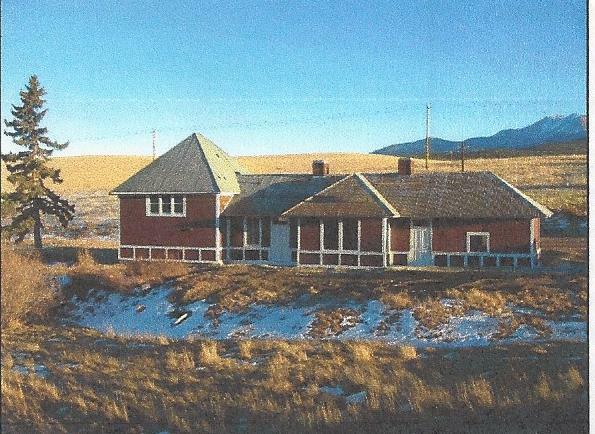 The first Midland Depot in Divide, constructed in 1887, burned and was replaced by the existing structure built in 1903. The Cripple Creek – Victor gold rush in the 1890s triggered a demand for transportation links from the mining districts to the cities of the Front Range and Arkansas Valley. The Midland Terminal Railway, connecting Divide and Cripple Creek, was completed in 1895. The Depot’s unique double ticket bays were designed to serve both railroads. Commercial and passenger railroad traffic through Divide gradually declined and the Colorado Midland closed in 1918. The Midland Terminal acquired its remaining property and continued service to Cripple Creek. By the end of World War II, the mines were closed and the population of Cripple Creek was less than 100. In 1949, the line was scrapped and the Depot building began its passage through various incarnations as a residence, an antiques store, and finally a popular saloon, The Whistle Stop. For over 60 years, the Midland Depot at Divide had been an integral part of Colorado’s transportation system. It is one of only three surviving depots of the Colorado Midland system. Of those, two are privately owned and not open to the public. The Midland Depot at Divide provides a valuable connection to a colorful and economically important era in Colorado’s history. Timing for preservation of the Depot is critical. Time, weather and natural geological subsidence are taking their toll. Join T.H.E. Coalition and its partners in this important project. Let’s get the Depot back on track! Click on these links for more information on the annual Midland Days Symposium and the Midland Days at Divide, Inc. mission.